The Answer is 9 octaves. Can you explain why this is so? The explanation is given in the next Reply. From the lowest C on the Lower Keyboard, to the highest C on the Upper Keyboard is a span of 5 octaves. That much is obvious. Now if you play the lowest C on the Lower Keyboard with a 16’ voice you hit a C one octave lower than the established 5 octave range. This means we have a range of 6 octaves......so far. Now if you play the top C on the Upper Keyboard with a 1’ voice, you can reach 3 octaves higher than that note. So 6 + 3 = a total of 9 octaves! Clearly, when playing that same high C, and by selecting a 4', or 2' voice, you can play on the octaves in between. So the full 9 octaves are within the reach of the Yamaha AR. A word about Pedal Stops. We tend to think of the organ pedals as providing deep and gruff, growling sounds. Obviously in some pieces of music, namely the final verse of a rousing hymn, those deep, almost ground shaking, pipes really do come into their own. But many organs can be ‘programmed’ to provide delicate high pitched sounds on the pedals. Also the pedals, which function as another keyboard for the organist, (Hence organ music consists of 3 staves: the right hand, the left hand and the feet.) can be used to produce a tune all by themselves – well with a little help from the organist, of course. Try this, on your AR. Select just either one of the Pedal Voice tabs in the Ensemble section. Then choose Organ Bass, from that particular Pedal Voice that you have selected. (it is either Pedal Voice 1 or 2.) It is the one in the left hand lower corner. Select the 8’ OrganBass from the buttons under the L.C.Display Screen. In the L.C.Display Screen, click the button on the left of the screen that corresponds to Condition. Now choose the buttons underneath the screen for Feet and select the 4’ variation. When you play the pedals, especially to the right hand side, it bears a strong resemblance to one of your keyboards. On large pipe organs, the pedal sounds can also be so high pitched that most of us couldn’t hear them because our hearing has deteriorated with advancing years. In the next Reply we discuss other speaking stops, called Mutation Stops, which we have already mentioned on this series of posts. There are other speaking stops, which are called Mutation Stops. These sound in intervals of pitch rather than whole octaves, so they are only used in combination with other stops. And here is a fuller chart, showing the effect of most of these different stops together. One of the significant features of the organ stops is that by selecting, or switching on those particular stops, then by playing just one note on the Keyboard (or Pedalboard) the organist is able to produce multiple sounding notes from the organ. This pattern is true for every note on the organ, including our Yamaha AR, and follows the identical pattern that we have demonstrated for the note of Middle C.
So you can see, if we select all 8 of the drawbars available (including the 1') on the AR80, when we press just one key down, 8 different notes actually sound together. I’ll let you work out what the effect of selecting the 11/3 stop, found on the Yamaha AR 100, but not on the AR80, is. This means that AR 100 owners can sound 9 different notes, by just pressing one key with all 9 of these drawbars selected! In the next Reply we investigate the Mixture stops. These are another kind of pitch stop, and rather than length measurements, are generally labeled with Roman Numerals. e.g. I, II, III, etc. Each Mixture stop sounds two or more different notes, when a single key is depressed. Like Mutation stops, Mixtures are used in combination with other stops. So if you select Mixture III as you play one note (provided you have selected a speaking stop) you actually hear three different notes played simultaneously. We do not have Mixture stops as such, on our AR organs, but there are features that enable us to utilise their function. The most obvious way for us AR players, is with our Ensemble buttons. Mixture stops on a pipe organ, simply make use of this variation much more easily and more quickly when selecting or changing registrations. In the next Reply we demonstrate Mixture stops on our Yamaha AR organs. We do have 3 Mixture buttons on our AR organ panel, so can you find them, before you read on? To demonstrate what a Mixture stop can do on your AR organ, try the following. From the Registration Menu select Classic Organ and from under the L.C. Display, choose Grand Cathed. Test what each keyboard sounds like. Now play any note, then toggle the Upper Keyboard Extra Voice switch marked Mix IV, which is illuminated, and you will appreciate the effect. Again from Classic Organ select Full Diapa. Now play any pedal note, then toggle the illuminated Pedal Extra Voice button marked Mix IV. If you haven’t already discovered it, the one other unique Mixture stop on your AR, is found in the Extra Voices for the Lower Keyboard. Isolate that in a similar fashion, to find out what it can do. In the next Reply, we pause to comment on tuning pipe organs. The manufacture of organ pipes and, I guess, also the tuning of pipe organs, is a speciality of our own Don Wherly. The goal of tuning a pipe organ is to adjust the pitch of each pipe so that they all sound in tune with each other. How the pitch of each pipe is adjusted depends on the type and construction of that pipe. When I was a teenager, I spent many summer holidays with my grand parents in West Norwood. They were caretakers of Lansdowne E.F. Church behind Woolworths. One of those summers, I was privileged to visit the organ loft, where the organ builders were in the process of building the new church organ. They start by tuning a key pipe (maybe Middles C) with a tuning fork and then selecting each of the other pipes in turn, matching it to the first pipe already tuned. I watched the organ builder blow into the pipe like a recorder, snip a bit off the end, blow again and when satisfied, fixed it into the pipe block. These were smallish pipes, that were very easy to handle and manipulate. I expect 32ft pipes may require additional help, or even some lifting gear, but the principle is the same. The tuning of an existing pipe organ, requires a similar procedure. Now you know why they are so expensive and equally expensive to maintain. Regulation adjusts the action so that all pipes sound correctly. If the regulation is wrongly set, the keys may be at different heights, and some pipes may sound even when the keys are not pressed. This is called a cipher. Equally, sometimes, pipes may not sound at all, when a key is pressed. So setting the regulation is vital. Tracker action, in some pipe organs, includes adjustment nuts on the wire ends of the wooden trackers, which have the effect of changing the effective length of each tracker. Tuning or repair can be a long onerous task and requires specialist knowledge and experience to do it properly and efficiently. Electronic organs like the AR do not require any of this rigmarole, thankfully. The AR does have the ability to adjust the overall tuning, so that if you are playing with another musical instrument, you can tune your entire AR to match that instrument’s pitch. Woodwind, brass and stringed instruments can be ‘retuned’, but not an instrument like an accordion. So this is a useful feature on our AR organs. In the next Reply we look at Non-Speaking stops. Non-Speaking stops do not produce tones, as their function is to modify the Speaking Stops. There are three basic ones found on most organs. These couple one manual to another or to the Pedals. So that one note depressed on the keyboard, will sound the same note on either one of the other keyboards or the pedal board, to which it is coupled. For example, coupling the Great * keyboard to the Swell keyboard, modifies the tone. So Middle C played on the Great keyboard, retains the same pitch, but changes quality, when coupled to the Swell keyboard. In addition the 16ft and 4ft intermanual couplers can also vary the pitch. The pitch designation (16, 8, 4) specifies the pitch at which the division is to be coupled. 8' is concert pitch in organ nomenclature. When using an 8' coupler, the division is coupled at its normal pitch. As the 4' pitch is an octave above the 8' pitch, so when a 4' coupler is used, the manual is coupled an octave higher than normal. This nomenclature is similar to the pitch designation used in organ stops. whereas 4' couplers are usually not employed to do this. However, 4' couplers are often used with Celeste stops in more gentle registrations; they effectively increase the number of notes that are sounding and increase the warmth and breadth of the ensemble. In the next Reply we look at the second of these non-speaking stops. Keyboards (or manuals) are separated so that the organist can play different sounds at the same time using the different manuals, and pedals. The manuals and pedals can also be coupled together so that both are played at the same time, with the main initiative coming from one of them. However, some smaller organs only have a single manual, with or without pedals. Intramanual couplers are different from intermanual couplers, as they couple one note on any of the keyboards (or pedalboard) to another note on that same keyboard at a lower or higher pitch. These couplers allow you to play stops of the organ at a different pitch level on the same manual where the stop is located. They are often referred to as Sub Couplers or Super Couplers. So when we play Middle C, we hear that note and either the lower C or the Higher C, depending on whether we have selected the 16ft or 4ft Intramanual couplers. Of course it is possible to select both of these couplers at the same time. This becomes a short cut way of selecting the 8ft, 16ft and 4ft stops that we first described earlier. However, if we select an 8ft trumpet, this Intramanual coupler enables us to double or treble the voice on that same keyboard by adding the 16ft or 4ft Intramanual coupler. 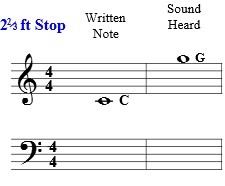 On some pipe organs, you may find the stop simply marked Octave and selecting this automatically adds the note an octave higher. 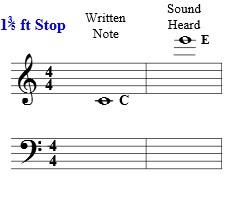 Less common is the stop labelled Sub Octave and this one selects the note one octave below the note you play. Note: by activating the Swell to Swell 16' coupler (Sub), the stops selected in the Swell manual will sound one octave lower than the key played on the Swell manual, but an exception is the first octave where the lowest 12 notes will only sound at unison pitch. 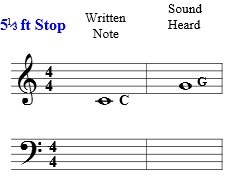 Similarly with the Swell to Swell 4' coupler (Super) activated, the stops selected in the Swell manual will sound one octave higher than the key played on the Swell manual, but an exception is the last octave where the highest 12 notes will not play if the selected stop is 2' or shorter. On our AR we can create this coupling effect by selecting an 8ft Trumpet as one voice and a 4ft trumpet as a second voice. It just needs more pre-planning for us and some careful thought as to how to achieve the end product. And in the final Reply we remind ourselves of the third non-speaking kind of stops. Tremolo is a device that creates a vibrato effect by mechanically shaking the wind source or by some other means, and so it changes the normal flat sound to a warbly one, which I am sure you are familiar with. Each stop adds to the quality of music emanating from the organ, and this particular stop has a very distinctive effect. Learning the organ, means we have to become very familiar with the instrument. Large pipe organs may well be daunting to us, but let me remind you that the Yamaha AR is loaded with ‘goodies’ that enable us to sample a vast range of rich and rewarding combinations of sound. So even with the AR we need to become very familiar with all that is available on them, in order to generate and provide others, as well as ourselves, with stirring and, dare I say, inspirational performances. This wraps up this subject of basic organ stops, but do feel free to add your own comments or ask questions, which we will try to answer for you.